-Heel turn instructions are incorrect–worked it up twice before realizing this. I googled “how to turn a sock heel knitting” and got generic instructions. Instead of using PSSO I did SSK. -8 rows of 1X1 rib. I wanted to do 2X2 but it looked weird with the tubular cast on. -20 rows after cuff before I started chart. I finished the first sock in about two days but it took me a while to start the second. 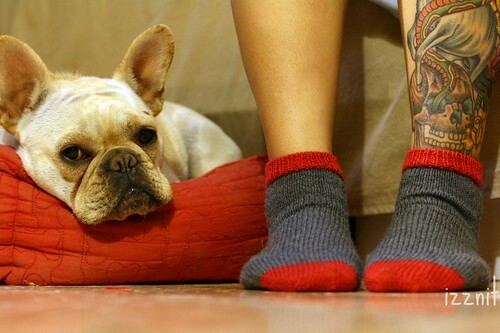 It wasn’t second sock syndrome (SSS)… more like wtf-yarn-tails-wont-stop-sticking-to-fresh-tattoo (WTFYTWSSFT). Happy Sunday! Hope everyone had a good weekend. I sure did! At first I was like “Yay, grey socks!”, and then I saw the back too! They’re perfect! 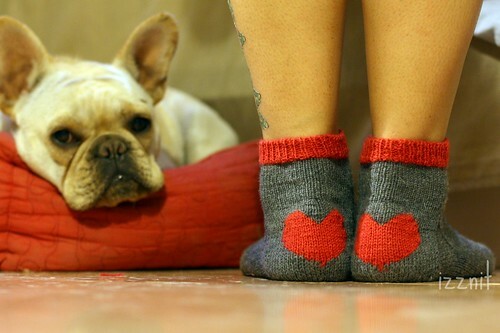 Those are the best socks I have ever seen. I found you through this Knithacker post. what! did you hand knit these? epic!